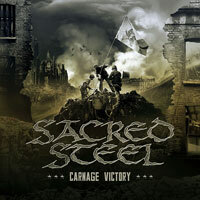 The respectable fanbase of SACRED STEEL had to wait for three long years but in the fall of 2009 their victorious massacre CARNAGE VICTORY finally finds ist way to the battlefields of the metal community. The band was not lazy though as they performed more live shows and in the six years of their previous career. The bandbus stopped a.o. in Greece, Italy, France, Sweden, Poland and Spain as well as on the Swordbrothers festival, Thrash Assault or the Summer Breeze Open Air. The new lineup turned into a real team within this time. As HAMMER OF DESCTRUCTION was almost a debut for the new lineup with all its typical raw power that such albums unleash the band shows really matured on CARNAGE VICTORY. The songwriting was done within two years and the recordings, mix and mastering (done in parts) took almost a year to complete. For the mix the guys used the proven hands of Achim Köhler who already did the band highlight albums like BLOODLUST, SLAUGHTER PROPHECY or IRON BLESSINGS. Musically and lyrically this is undoubtelly the most mature SACRED STEEL album yet. While the Opener CHARGE INTO OVERKILL rolls over the listener in typical speed manner already the MERCYFUL FATE cover DON’T BREAK THE OATH is the first big surprise. At the latest when you hear the mid-tempo title track if becomes clear: this album is 100 % SACRED STEEL but somehow different and more serious. This continues with tracks like BROKEN RITES or CROSSES STAINED WITH BLOOD. SACRED STEEL are surely one of the few still arvie metal bands who combine an anti-christian (DENIAL OF JUDAS) and satanic (CEREMEONIAL MAGICIAN OF THE LEFT HAND PATH) message with classical speed- and heavy metal. They are hereby completelly in the tradition of bands like MERCYFUL FATE or ONSLAUGHT. For sure this album also offers some less-serious, typical horror stuff (THE SKELETON KEY) or the minimalistic and pure statement to the METAL UNDERGROUND. People that say that SACRED STEEL only repeat themselves should really listen carefully this time! But one thing’s still for sure: SACRED STEEL will never be everybody’s darling – and proud of it!